Cathy Isom has, over the past week, discussed several different types of chickens for your backyard flock. Today, Cathy tells you about the chickens known for having sweet personalities paired with exceptional egg laying capabilities. That’s coming up on This Land of Ours. The Plymouth Rock chicken is an exceptionally friendly bird that will make for the perfect barnyard pet with exceptional laying qualities. These birds are arguably one of the most popular breeds here in the United States and other parts of the world. 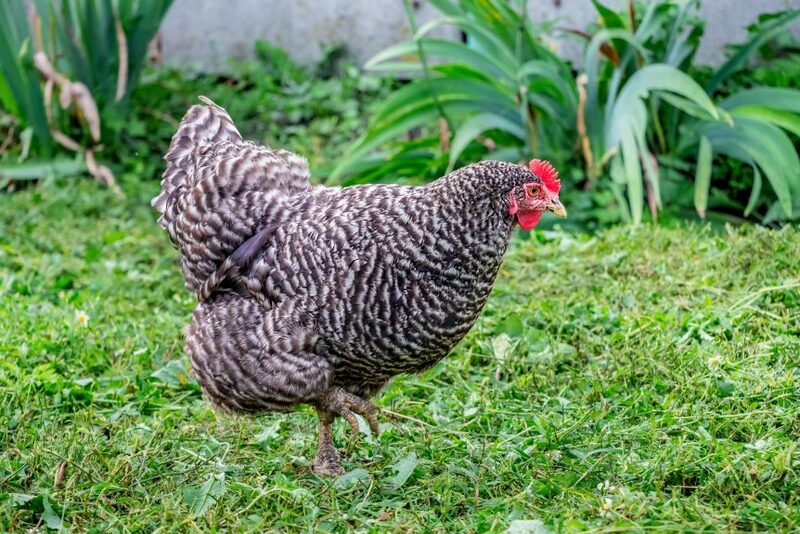 In addition to being excellent layers, The Barred Plymouth Rock is very popular, and noticeable, because of the grey rocklike pattern in their feathers. Often referred to as Barred Rocks. Plymouth Rocks, have been bred to be more of an egg production breed than meat production. Plymouth Rocks have excellent egg production, sometimes laying up to 6 eggs per week. Many chicken keepers have found Plymouth Rock roosters to be protective of their hens, but respectful to people. They’re also one of the most low maintenance breeds you’ll ever raise. They’re very vigorous and hardy birds and do not suffer from the health conditions that every other bird doesn’t occasionally deal with.